Ananias and Sapphira had sold a piece of their possession so that they could offer it to the Lord. But Ananias and Sapphira held back and kept part of the money they got from selling the possessions. Ananias brought some of the money and came to lay it down before the apostles as an offering to the Lord. After Ananias heard Peter said these words, he fell down and died. The young men came and wrapped his body with a cloth. Then they carried him out and buried him. 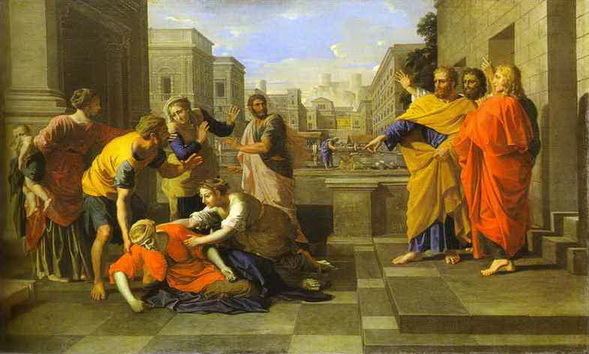 After three hours, Ananias’ wife, Sapphira, who was not aware of what had happened to his husband, entered the place. Sapphira immediately fell down on the floor and died. The young men that came in found Sapphira was dead. They carried her out and buried her beside her husband, Ananias. Fear came upon everyone at the church and all who had heard about it.